The V-MODA REMIX blends its refined design with that signature V-MODA sound and tosses in a headphone amp and USB-C charging to boot. V-MODA is well known for making some serious headphones with serious sound. 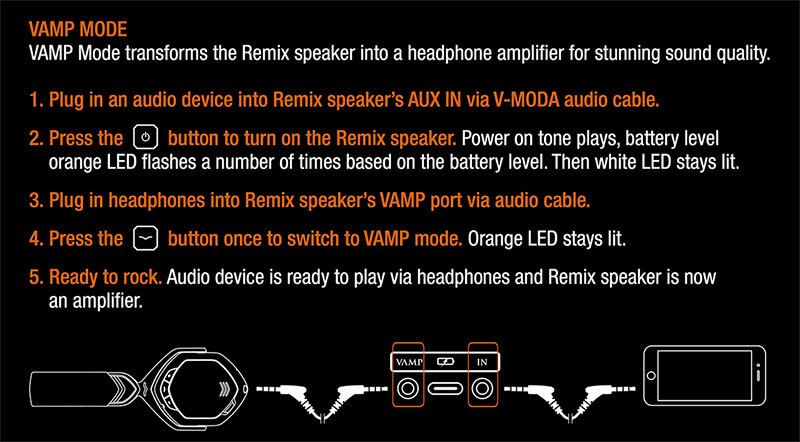 Now the company has decided to dive into the world of Bluetooth speakers with the V-MODA REMIX and what a dive it is. V-MODA takes pride in their products, from their design all the way up to their sound. The company is also proud of their customization options, which can get really pricey if you go nuts. The V-MODA REMIX blends its refined design with that signature V-MODA sound and tosses in a headphone AMP and USB-C charging to boot. 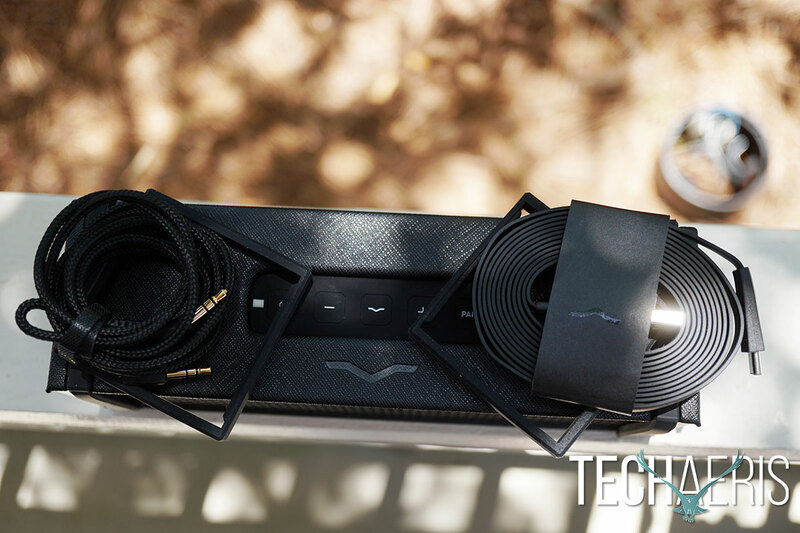 Read on for our full V-MODA REMIX review. Love that V-MODA V logo. V-MODA design has always been one of my favorite things about their products and the V-MODA REMIX is no different. 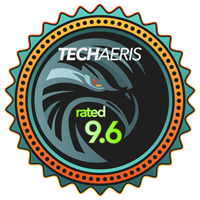 The company seems to spend a lot of time getting the design aesthetically and functionally on point. 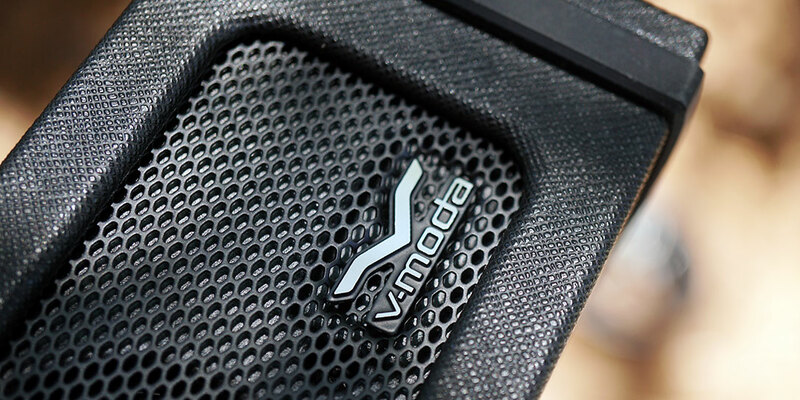 The V-MODA logo brings thoughts of a premium supercar such as a Lamborghini or Ferrari. The whole speaker is covered in premium materials with the top, bottom, and back all covered in a silky black vegan leather. The rest of the material is high-quality aluminum with the REMIXRings made of a sturdy rubber material. There is also an all aluminum version without the vegan leather. There is subtle REMIX branding on the sides and that nice V-MODA logo engraved on the top of the vegan leather. There is one small V-MODA logo on the back as well but the branding is not at all gaudy or in your face, it melds in well with the rest of the design. The back of the REMIX. The top of the REMIX is where you have your controls including the LED power indicator, power button, volume down, multifunction button, volume up, and pairing buttons. Around the back of the V-MODA REMIX you’ll locate the VAMP input which is a very nice addition to this speaker, more on it later. The back also houses the AUX in for plugging your device in instead of using Bluetooth and finally the USB-C charging port. USB-C charging is a first here on a Bluetooth speaker, at least on speakers that I have used. Overall the design is spot on, I love V-MODA’s aesthetic looks and they do offer customization beyond what’s included. 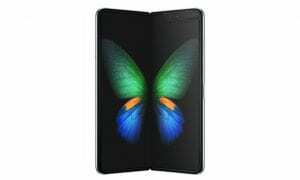 The customization service is something the company is very proud of but you can get carried away and rack up a hefty price tag if you’re not careful. There are other REMIXRings available and you can even have caps 3D-printed by V-MODA just for your REMIX. Still, even without the deep customization, this speaker looks amazing out of the box. Bluetooth pairing is simple. Bluetooth speakers are fairly normal these days and I suspect no one should have issues here. You can also connect your device via the AUX input which does produce a better sound. Using the volume controls is pretty self-explanatory but that multifunction button does serve a few purposes, see the graphic below for a detailed view of what it can do. Overall a very simple product to use. How to use the controls. 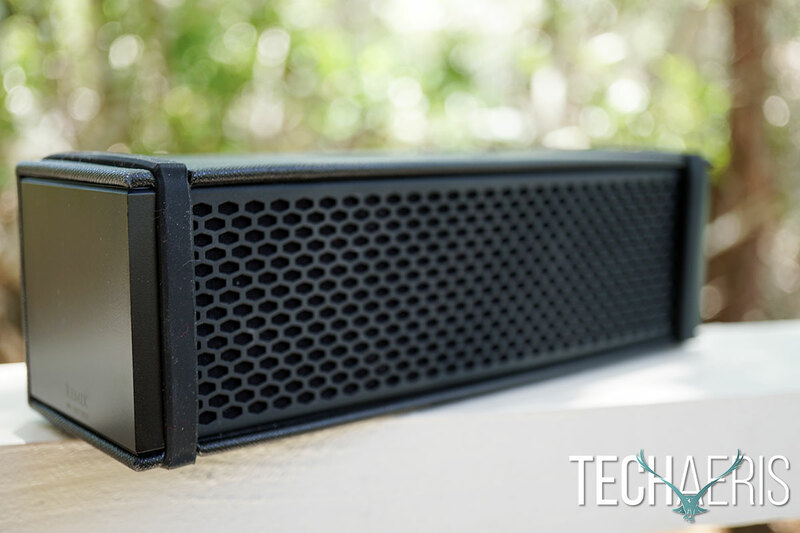 Immersive and engaging, that’s what comes out of this very small speaker. The depth of the bass is astonishing, the highs and mids are all well balanced and that deep bass just holds it all together on a cloud of sound. 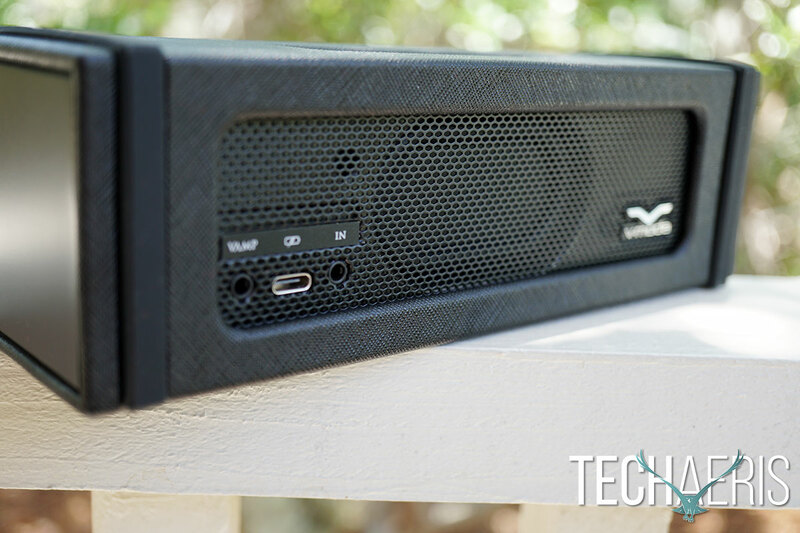 For the size of this speaker, it produces a very robust and complex sound signature. This is certainly going to fill the need for a personal Bluetooth speaker for many users, it may not be perfect for a large party by itself but it does have daisy chaining. If you have another REMIX you can plug them in together and double the sound which could easily be great for a small party. You can daisy chain these via Bluetooth or wired, either method will work. You can also connect two audio sources via Bluetooth and switch between the two sources, great at parties where you may have multiple playlists on different devices. So some of these features other Bluetooth speakers have, no question of that. 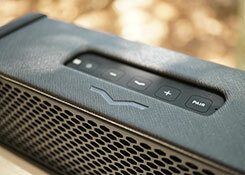 One feature not found in most any other Bluetooth speaker is the addition of a headphone amp, V-MODA calls it the VAMP. Built into the back you have the amp which will significantly improve your headphone listening experience. Amps are generally used by audiophiles who want to hear every subtle nuance of their music. Bluetooth sound isn’t the best, it’s acceptable to most but not to some. The VAMP requires you to plug in the source device into the REMIX AUX port and your headphones into the VAMP port which will produce audiophile quality sound, perfect when used with the new V-MODA CROSSFADE 2 wireless headphones. Amps are great when used with high-quality audio files like FLAC files. Though not everyone will notice the sound quality differences as they can be very subtle and you do need a decent pair of headphones to really notice. I think the addition of the VAMP to the REMIX is going to go over well with the audiophiles in the crowd. 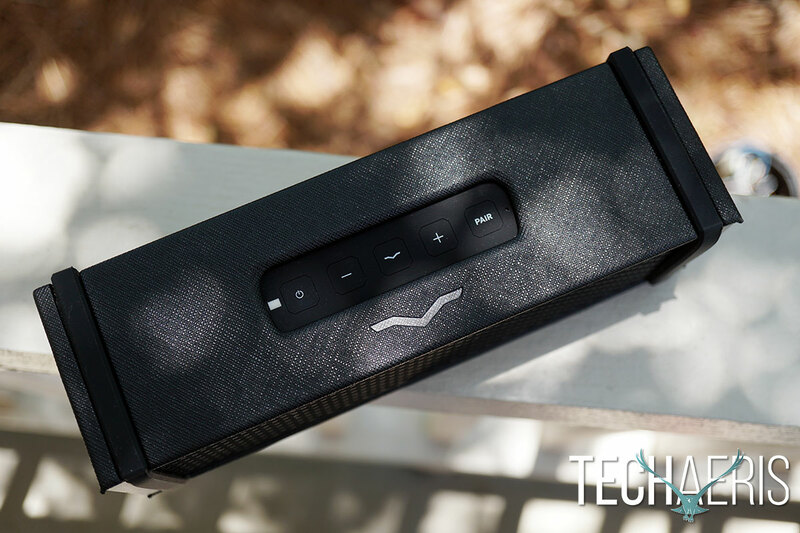 The speaker is portable and sounds good enough in Bluetooth mode for on the go music listening but then they have the option of HQ audio with the VAMP. Overall this speaker sounds amazing for its size in Bluetooth mode and even better when the device is wired in through AUX. The Bluetooth reception is pretty standard here with walls and obstacles hampering Bluetooth signal, nothing out of the ordinary. Call quality is good here as well, though I’m not a fan of speakers being used for phone calls so I never use this feature much. Battery life is advertised at 10+ hours and I was able to get just slightly over 10-hours with the volume at 50%. The V-MODA REMIX isn’t cheap but it also has a few other features other Bluetooth speakers don’t have, USB-C charging as well as the built-in amp. Amps alone can get pricey but V-MODA included it on board here and I think the $300USD asking price is reasonable for this all around package. No, the V-MODA REMIX is probably not for everyone but it does sound amazing and offers up an attractive design along with the addition of an audiophile grade amp for separate headphone listening. *We were sent a sample of the V-MODA REMIX for the purposes of this review.